I first wrote this when hay was really tight in AZ in the winter of 2005/2006. As hay continues to be in short supply in many areas, some will see the availability of Sudan hay as a solution. There is a great temptation to buy Sudan grass hay as it is CHEAP - it can be found in areas around Arizona for about $6/bale and Bermuda and alfalfa are expensive! I, personally, do not feed Sudan grass hay (also known as Love grass, Johnson grass, Sorghum/Sudan hybrids) to my horses, or let them graze on these grasses. Several varieties of Sudan grasses and hybrids were introduced because they are easy to grow, drought resistant and produce fairly high yields with, generally, good nutritional content. They are becoming popular as ruminant forages and can be useful for dry cows and meat-producing animals. 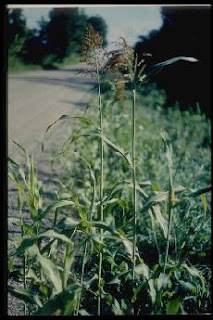 Sudan grasses and hybrids pose two problems - nitrate toxicity and prussic acid (cyanide) toxicity. The extent of the problem depends on growing and handling conditions - neither of which we, as end use buyers, have any control over. If properly grown and cured, these hays can be "safe" but I would not feed to any horse without having it analyzed for nitrate content - http://www.dairyone.com/Forage/FactSheet/Nitrates.htm and http://www.dairyone.com/Forage/services/Forage/forage.htm. There is conflicting information as to whether ensiling hay increases or decreases nitrate content. Google "Sudan grass nitrates" for a further extensive list of information on these grasses. Bottom line - your horse's safety. Hay prices typically increase this time of year until the first spring/summer cuttings are in. But I would avoid the temptation of the cheaper Sudan hay. Extend your available Bermuda by adding some alfalfa (if only doing this for 3-4 months I wouldn't be too concerned about the higher calcium for an adult horse but would consider adding some phosphorus for a young/growing horse) or substituting some plain hay pellets such as Mountain Sunrise Bermuda or Timothy pellets or Lakin Lite pellets at the rate of one to one and one half lbs pellets to replace two pounds of hay. You can also increase the amount of non-molassed beet pulp - substitute for hay at the same rate as for pellets. You don't want to substitute grain based feeds for forage but could use one of the "complete" forage-based low sugar/starch feeds for some of the ration. If you are using the AZ Regional Mix and substitute forage pellets or beet pulp for some of your hay, continue to feed at the 3oz/day (for "average" 1000lb horse getting 18-22 lbs dry weight of feed/hay). If you are using another supplement or fortified feed, continue to feed at a rate that will supply 90 to 125mg of copper/day for the same "average" horse. A consideration if you have stands of Sudan grass (or its varieties) on your property is to remove it. Probably the simplest way would be to kill it off using a herbicide* [it is likely to be resistant to tilling or disking]. Then encourage growth of Bermuda or other grass, which is less likely to accumulate high levels of nitrates. If you are going to graze pregnant mares, it will be worth while to have your soil tested (spreading manure does increase nitrate levels) and have an extension agent take a look at your property/pasture to identify grasses and weeds for nitrate accumulators. *Using a herbicide to control weeds and invasive grasses is safe as long as label directions are followed. Non-chemical weed control will be more labor intensive, requiring year round attention (mowing and overseeding in winter and summer) and may take more time to produce a grazable pasture or paddock. Your best insurance for safe hay at reasonable cost is to plan ahead, find a reliable source and lay in a supply of good hay when prices are down in the summer. If your hay storage space is limited, invest in some good tarps and pallets and learn how to stack and tarp for long-term storage. Our low winter rainfall will likely result in higher hay costs this year - we may want to rethink breeding or acquiring another equine mouth to feed. This summer will also be the time to lay in a supply of plain hay pellets - easy to store and safe to substitute if hay supplies become short next winter. And it doesn't hurt to support your local rain dancer. The EPSM group - a group of owners of horses with EPSM/PSSM which includes not only draft horses but warm bloods - many trained at high levels of dressage - and some light horse breeds has become more active. Eleanor Kellon, VMD has been working with group members helping them develop and fine tune treatment protocols and her course on Neuro and Muscular Disorders expands on the information from the earlier Nutrition as Therapy program. While feed companies scramble to develop new ways to market "magic feed", Dr. Kellon's approach begins with sound nutritional foundations based on NRC guidelines and a basic understanding of how the parts of the equine body works - no gimmicks or magic bullets. 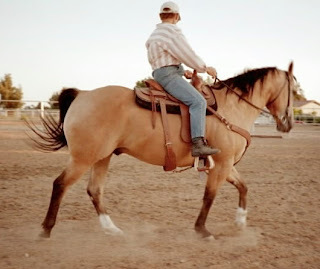 Claire's story about their Quarter Horse Doc is a must read if you have a horse that is displaying any of the signs of Polysaccharide Storage Myopathy (PSSM). 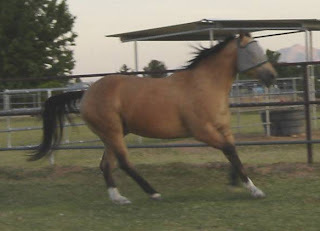 cranky when asked to canter both under saddle and on a line. Finally getting a correct diagnosis, Claire was able to place Doc on a simple targeted nutrition plan with the help of equine nutrition specialist, Eleanor Kellon, VMD, which has alleviated his symptoms. Read Claire's article to see how applying research and science can provide a straight forward approach to sorting out this often baffling condition. And check out the EPSM/PSSM group at http://sports.groups.yahoo.com/group/EPSM/ for support and see how the latest updates on diet and using ALCAR (Acetyl L-Carnitine) or L-carnitine protocols are working.